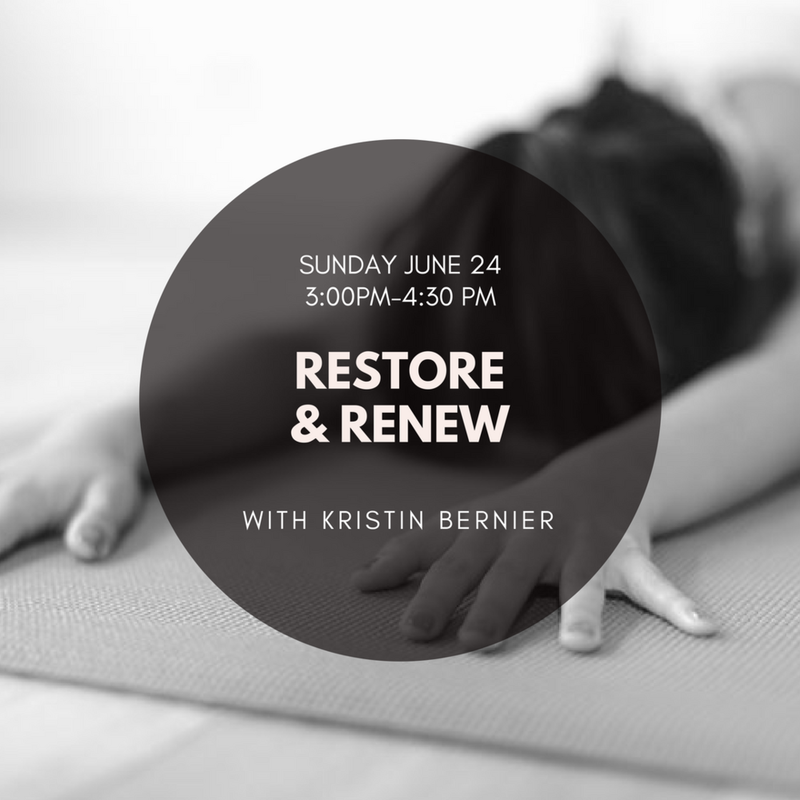 This work shop will include a 60 minute Yin Yoga practice. Kristen will lead this Yin practice in a gentle, calming, and grounding manner and guide you into a blissful meditative state. After a peaceful practice, attendees will enjoy a holiday spiced tea and mindfully prepared treat. The tea and treat will be prepared from scratch, by Kristen Carlson, using all natural and organic ingredients. Step out of the cold for a 90 minute gift to yourself and find a peaceful reset from amidst the busy holiday season. $45 per person. Please pre-register. 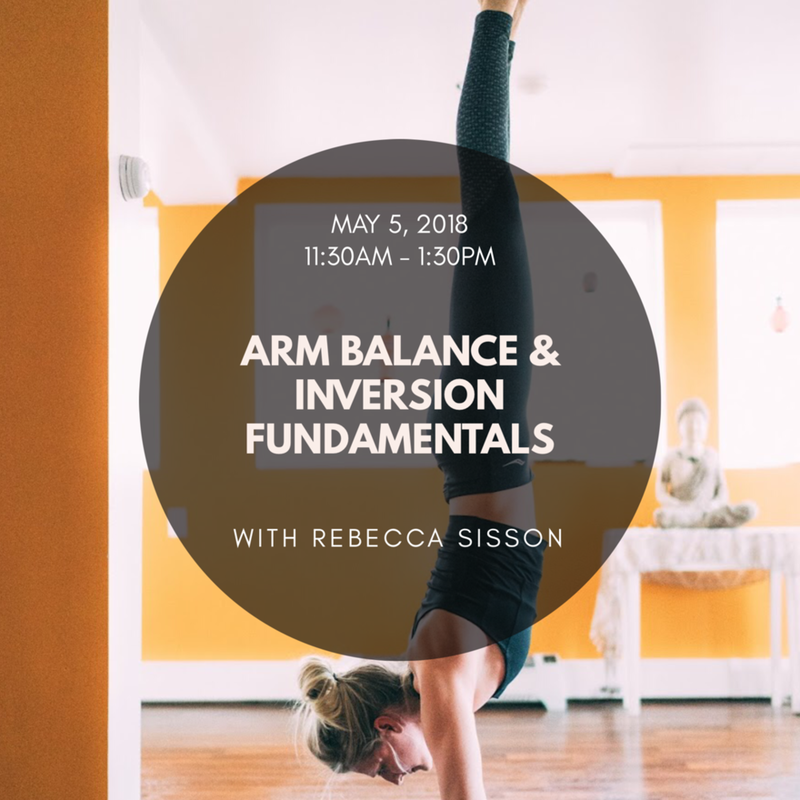 In this special monthly class, Rebecca will lead students through the set sequence of postures in the Ashtanga Primary Series. This class emphasizes the traditional sequence, foundations and alignment of Ashtanga Yoga. This class is appropriate for beginners with some experience with vinyasa or Ashtanga yoga all the way to advanced level practitioners. This class occurs the last Saturday of every month, 11:30am - 12:45pm. Regular class cards, memberships or drop-ins can be used for this class. Regular class cards, memberships or drop-ins can be used for this class. Mommy & Me Yoga provides an opportunity for new moms to reconnect with their bodies while bonding with their babes. Yoga poses, breathing exercises and guided meditations are focused on slowly regaining strength, flexibility & mental calm to the mother. Experience pose sequences, gentle core re-builders, strengthening postures and calming, restorative time for you and your baby in this safe and playful environment. You will be invited to incorporate baby into some of the poses, as well as remain connected to baby through eye contact and touch. Enjoy the benefits of group socialization, bonding and the positive energy created by our welcoming space. This class is designed for new moms and their babies age 6-weeks to non-crawlers. No prior yoga experience required. Know that it is natural for your baby to cry, so please feel free to change a diaper or feed your baby anytime during class to make them comfortable. Please feel free to bring a soft towel or blanket for your baby along with a favorite toy. New moms should receive permission from their care provider to begin this or any exercise postpartum. Please contact Christy LeMire at christy@christylemirewellness.com with questions. Take some time for yourself to discover the “other half” of yoga. In this 90 minute Yin class with Christina Barbieri, you will begin with a simple meditation cultivating greater kindness and compassion towards your practice. Then you will be led through a series of Yin postures to nourish your yin energy and calm your inner yang fire. This class will end with a few nourishing poses paired with essential oils, leaving you feeling more balanced and calm, promoting a restful and soothing night of sleep. All levels of yogis are welcome, from most experienced, to the beginner yogi, and if you’re always on the go or your go-to yoga practice is always vigorous, then this practice is especially for you. $25 per person. Please preregister. Enjoy this calming, meditative practice led by Experienced Yoga Instructor Emily Wiswell. Each posture is designed to open up and release tension and blockages in the body with the supported poses using props. Enjoy meditation and readings throughout. Reiki healing and essential oil assists will be offered during the practice as well as live accompaniment by talented musician and singer songwriter, Kristen Miller. Indulge in a musical blend of live Cello and Himalayan Singing Bowls. Enjoy this deep restorative practice and leave feeling renewed! No down dogs. No prior yoga experience necessary. $30 per person. Please preregister. Everyone's favorite workshop is back again! Join Sarah Oleson for a fun and unique partner yoga class! In this loving workshop we will practice communicating in ways other than verbal as we explore balance, strength and flexibility, sometimes even using your partner to hold you up! Rediscover connection, compassion, and leave feeling lighter, recharged, and playful. This workshop begins with a vinyasa flow and ends with guided partner meditation. No yoga experience is required. Come with an open mind and an open heart. This workshop is for romantic and non-romantic partners alike. Or, come solo and we'll pair you with a partner! Mommy & Me Yoga provides an opportunity for new moms to reconnect with their bodies while bonding with their babes. Yoga poses, breathing exercises and guided meditations are focused on slowly bringing back strength, flexibility & mental calm to the mother. Experience flowing pose sequences, gentle core re-builders, strengthening postures and calming, restorative time for you and your baby in this safe and playful environment. You will be invited to incorporate baby into some of the poses, as well as remain connected to baby through eye contact and touch. Enjoy the benefits of group socialization, bonding and the positive energy created by our welcoming space. This class is designed for new moms and their babies age 6-weeks to non-crawlers. No prior yoga experience required. Know that it is natural for your baby to cry, so please feel free to change a diaper or feed your baby anytime during class to make them comfortable. New moms should receive permission from their care provider to begin this or any exercise postpartum. Pre-registration for the 4-week class series is required. 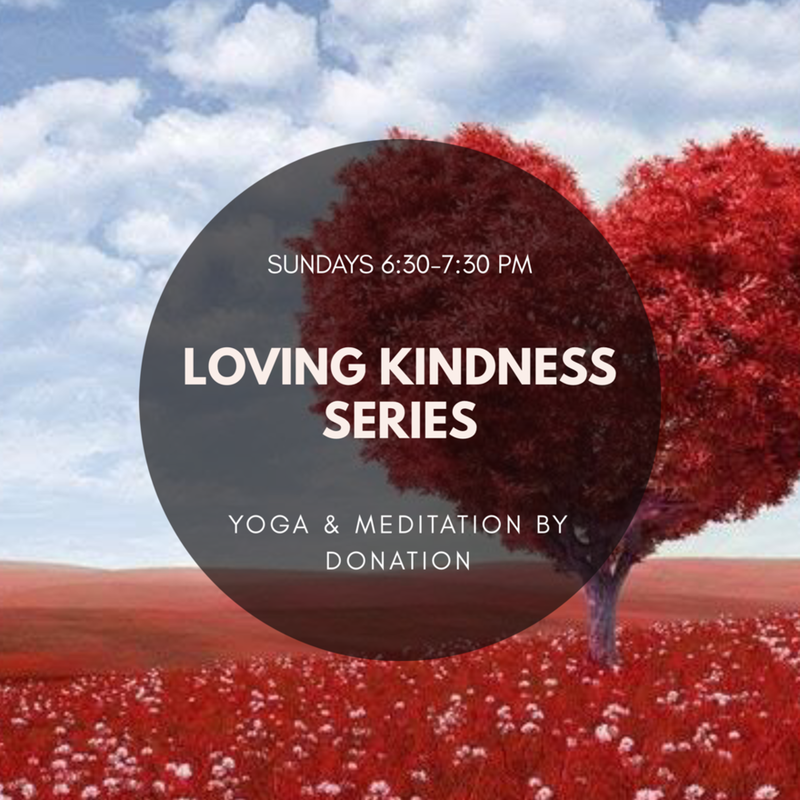 In this three-part series donation yoga class, come experience 40 minutes of heart-opening vinyasa yoga flow and a 20 minute loving kindness meditation. Feel the tender heart-space as we send loving kindness to ourselves and all beings. Each week students donate what they wish for class. 100% of the proceeds will go directly to the charity. February 4: The Veteran's Yoga project, and educational and advocacy organization dedicated to improving the health and well-being of military veterans. Renew and refresh on every level. Transition with the season feeling energized, lighter, healthy and balanced! Need to hit your body's reset button after the holidays? Kick off the New Year feeling energized, healthy and balanced! Strengthen your immunity, boost your mood and set yourself up to maintain balanced healthy eating habits throughout the year ahead. Cleansing does not have to mean feeling deprived or starving on a liquid diet. This cleanse is gentle on your body and delicious on your palate. Satisfying, nutrient-dense foods free of inflammatory ingredients. Let me guide you on a highly effective, non-extreme cleanse made up of high quality fresh whole foods. Your cleanse menu will contain raw and lightly cooked vegetables, leafy greens, soups, gluten free grains, smoothies, teas, and suggested optional supplements. This cleanse is flexible and I support you to create a meal plan that your are comfortable with and that you will thoroughly enjoy! Relaxation and self care activities allow for a complete detoxification experience. - Pre-cleanse packet with guidelines on how to prepare and what to expect. - A daily menu and schedule for the 5 cleanse days. - Daily emails with an affirmation and self care recommendation. - Post-cleanse packet with guidelines on how to ease off the cleanse. - A group Facebook page to share your experience, encourage and support each other! Have questions? Check out the Cleanse FAQs for more details. Escape the New England chill with Sarah Oleson for a "Summer Vibes in Winter" Yoga class. The slow tempo and rhythms of reggae music will allow you to warm up and flow to sweet island vibes... forgetting about the cold of winter! Begin with a fun vinyasa flow, followed by sweetness and surrender to your favorite bob Marley Jams. Includes a complimentary fire cider shot from the Juicery to warm you from the inside out! All levels welcome. $25 per person. Join Emily for this special two hour workshop focusing on healing trauma and pain through the energetic body. Learn about the seven chakras through lecture, feel where they exist as you move through a dynamic flow, and dive into your own emotional healing through awareness, movement and meditation. This is a practice for all levels, body types, disabilities, religions and genders. Please pre register. $35 per participant. Join Sarah at noon on Thanksgiving day to flow before you feast! Regular class cards, memberships and drop ins can be used for this class.